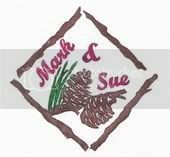 Letterboxing with Mark & Sue: Still Time to Sign Up for Bed & Boxing . . . Still Time to Sign Up for Bed & Boxing . . . 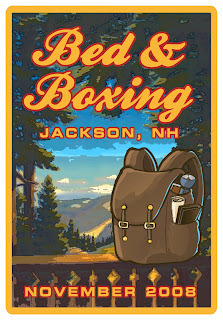 There is still some time to sign up for Bed & Boxing - our next Pinecone Adventure. We've extended the signups for 2 more weeks. At present, there are 30 people signed up. Initially, there was only about a 2 week window in which to sign up and then Sue & I hit the Oregon trail. If you are interested in attending, you can find all the info you need at our special Bed & Boxing webpage. Notice the nifty, retro logo to the left? It's our logo for the event and has been designed by PA's own Crayola Posse members True Indigo and RGBisMe. They also designed the winning patch for our Newboxers list and our recent First Ever Letterboxing Cruise. Sue & I love their work which is why we keep going back, asking for more! Thanks Terri & Jim, we really appreciate the wonderful work in such a timely fashion and exactly what we wanted!